Mina Al-Oraibi is the Editor in Chief of The National newspaper, a daily English language regional newspaper based in Abu Dhabi. An Iraqi-British journalist, Mina has over 15 years of experience covering Middle Eastern, European and American politics and current affairs. Prior to assuming the role of Editor in Chief of The National, Mina was a Senior Fellow at the Institute for State Effectiveness (ISE) and a Yale World Fellow. At ISE, Mina is working on developing policy recommendations for improved governance in the Middle East and North Africa region, with a focus on Iraq and Syria, in addition to researching ways of redefining the social contract in the Arab world. Before starting her fellowship at Yale, Mina was the Assistant Editor-in-Chief of Asharq Alawsat, the international Arab-language daily newspaper 2011-2015. Previous to that, she was the Washington Bureau Chief for the newspaper. 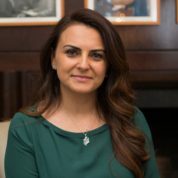 She has written extensively on US and European policies in the Middle East, covered diplomatic and security developments of the region, in addition to conducting several high profile interviews including with US President Barack Obama, US Secretary of State John Kerry and Iraqi Prime Minister Haider Al-Abadi. Mina also covered the Geneva talks on Syria, United Nations General Assembly meetings for the last decade. A contributor to numerous publications, Mina is a frequent guest on television and radio news programs, including on BBC. Mina is a Special Advisor to the Global Dignity Day Movement and a member of the Global Future Council on Regional Governance and the International Media Council. She is also a member of the board of trustees of the American University in Iraq – Sulaimani. Mina was named as a Young Global Leader by the World Economic Forum in 2009. She completed her Bachelors of Arts (Honours) and Masters of Arts in Modern History from University College London. "Highlighting and celebrating the central role of teachers in building societies, economies and nations is vital. The Global Teacher Prize has brought teaching into focus and has encouraged us all to champion our educators."